Weather Report was an influential jazz fusion band of the 1970s and 1980s, one of the bands that defined the genre. Their initial style was collectively improvised free jazz with a strong rhythmic pulse and latin influences; moving into more funk-oriented rhythms. The sound also developed from an acoustic lineup to increasingly synthesised textures as keyboardist Joe Zawinul embraced successive generations of technology. The band was founded in 1970 by Josef Zawinul (keyboards) and Wayne Shorter (saxophones) following their experiences in Miles Davis's pioneering electric band of the late 60s, although they had been friends for a decade before this. Zawinul and Shorter were the only permanent members: other musicians included bassists Miroslav Vitous, Alphonso Johnson, Jaco Pastorius and Victor Bailey; drummers Alphonse Mouzon, Eric Gravatt, Chester Thompson, Peter Erskine and Omar Hakim; and percussionists Airto Moreira, Alex Acu&ntilde;a and Manolo Badrena; with numerous other collaborators and guests. 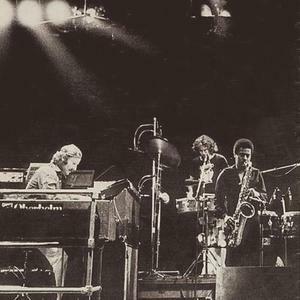 Weather Report's earliest releases owe a clear debt to Miles Davis's late 60s electric style, but by the release of Mysterious Traveller in 1974, the group had arrived at a style of its own: several of the tracks depend upon propulsive rhythmic figures, with solos more explorative of mood than technical 'excellence'. In this respect they were always more artistically ambitious than the majority of other jazz fusion artists. From Black Market (1976) until Weather Report (1982) the band's line-up was at its most stable, with Zawinul, Shorter and Pastorius remaining constant as the group's core. This period saw the release of Heavy Weather (1977), the album which brought Weather Report to its widest public awareness with the hit single Birdland. Following Pastorius's departure, the constant revolving door of musicians, coming down from their peak of popularity, and conflicting solo projects all took an increasing toll on the band. Their final release This Is This in 1986 was dominated by Zawinul's keyboards and included solos by Carlos Santana; Shorter's saxophone was hardly to be heard at all. A full history and discography can be found at http://www.binkie.net/wrdisc/.